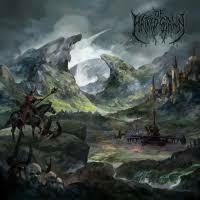 New to the scene, OF HATRED SPAWN released their debut self-album last year in November. Natives to Ontario, brothers JJ and Remy Tartaglia have forged a dying star-heavy album that is brimming with pessimistic musings about the rot of humanity, all growled in an acid spit-fueled rage to the background noise of destroyed instruments. Of Hatred Spawn is Death Metal punctuated by moments of breakneck tempos and avalanching drum kits. The album aims to bury you six feet under with the seven thousand kilograms of sound blasting through your speakers in a relentless, battering attack that leaves your ears, eyes and nose bloody. Whatever peaceful, tranquil fields of verdant landscapes and tasteful instrumentals OF HATRED SPAWN started us off with in the starting track “Overture” immediately dissolves into a white vapor from the harsh beams of “Global Dehumanization”. Matt Collacott’s screams furiously against the dissonant sounds of Death Metal that bloom in violent, man-eating sprouts around him. OF HATRED SPAWN packs every note with enough toxic energy to eat several holes through the track. This self-titled album is a solid debut that is clean and full of ecstatic rage that immediately explodes like an infected zit upon opening it up. A mad rush of pent up frustration that has been left sitting out in the sun for too many days until it starts to bubble and fester, Of Hatred Spawn is the newest face of the Death scene that doesn’t fight for a spot on the throne, it carves one from nothing itself.